ryantorrancebmxSorry for lack of clips bangerzzz coming soon! !Out in Orlando clipping up with @brianstump good times!!! Thanks babe @dirrtypawz for the capture!!!! “In 1994, I learned how to do barspins. I’ve never been able to bus-driver them, instead, I’ve used the ol’ pinch your knees on the seat, sling em’ and hold your breath. This was also at a time where my seat post was at least four fists high, and the seat itself was usually an extra fat, $15 railed seat (bought from the local bike shop after being taken off a complete MTB). Over the past 24 years, my seat post has gotten lower and lower (now, to one fist high), and my seats have alternated from fat, to slim, back to fat and now, to this Deco TA (Terry Adams) hybrid that sits somewhere in the middle. 1. A balance point, centering my rig if I’m doing something that pulls my bike either too far to the left, or too far to the right. As an example, while doing a smith grind over a hip, my back end fish tails out quite a bit until my seat catches my right knee, pulling it back to center. You don’t necessarily need a padded seat to do this BUT, when you do 100 in a row, that extra padding saves you from a rash and knee bruising. The Deco TA seat checks out here perfectly. 2. The second and most import aspect as described in the intro: offering clamping area for my knees when spinning the bars. –Firstly, as opposed to my old fat seat, the TA seat is ALL Kevlar. There’s absolutely no sliding at all on any vinyl. So, where ever my pants catch during a knee pinch (the sides, lower, higher, etc..), it never fails. –The more contoured yet still heavily padded design allows for the seat to sit comfortably right underneath my knee cap during a knee pinch. Basically, it mimics the contours of your legs. This allows for a smaller seat profile, and a barspin that takes less effort (I never consciously know that I’m pinching my knees with the TA). –The most important thing (though it’s much more of an indirect side effect of the seats design): IT IS INCREDIBLY LIGHT. My bike has to sit around 19lbs. The Deco TA seat is a perfect compliment to that. Brag about the Florida winters and riding year round. Summer is here and so is my leak. Sweating to the oldies. Hot as it gets and even hotter hands. Missed my one hand twice, landed one handed n slipped the other hand but rode out. @chaddegroot #decobmx #bmx #flatland hear that #profilezcoaster tick? Or click? 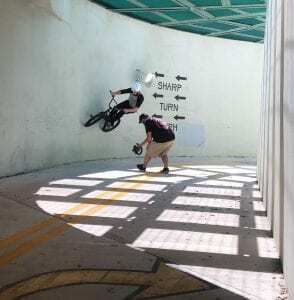 The post Dome piece, Wisconsin, Fise, TA seat appeared first on DECOBMX.